Description: This Special Collection of University of Hong Kong Faculty of Law student research essays on alternative dispute resolution originates from the dispute resolution research and teaching curriculum in the HKU Faculty of Law. 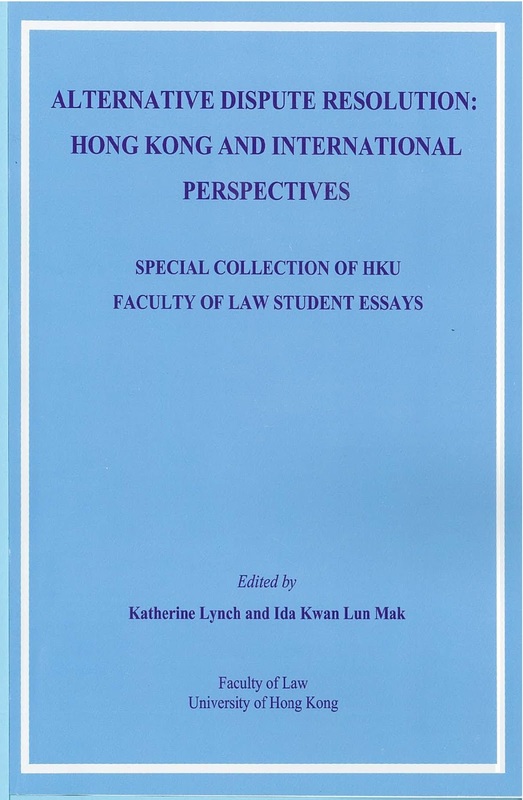 This inaugural collection presents undergraduate and postgraduate student research essays written on a variety of dispute resolution issues of relevance for Hong Kong and internationally. The aim of publishing this collection of student essays is to showcase excellent student research work in dispute resolution and to contribute to the developing body of research literature in Hong Kong on alternative forms of dispute resolution. It also seeks to contribute to knowledge sharing and knowledge exchange between Law Faculty students and the general public and broader community of Hong Kong – the aim is to encourage students to produce high quality research on important practical and policy issues for Hong Kong and then exchange and share this research through publication and law students as future academics, legal professionals and policy makers in Hong Kong with important research contributions to make to the community at large. This supports the University’s vision to produce distinguished graduates “committed to lifelong learning, and professionalism, capable of being responsive leaders and communicators in the field”.